We know this. Michael Mann knows this. And, throughout his “true story”, you can’t help feeling that Johnny Depp’s Dillinger knows it too. He’s a dead man walking from the moment we meet him. Meaning Mann’s movie isn’t a biopic, it’s an elegy – one long dying breath. When we do meet Dillinger, he’s already a Tommy-Gun-blazing master criminal, busting his men out of Indiana State Prison and roaring away under an epic blue-sky to a heroic soundtrack. A better title might have been The Man Who Shot John Dillinger. Like John Ford before him, Michael Mann loves to print the legend, turning cops and crims into duelling demi-Gods. Thing is, John Ford never printed the legend on HD. Armed with hyper-real, hi-def video cameras, Mann and Heat cinematographer Dante Spinotti makes mythic movie-drama look like faux-documentary. This is not American Gangster. This is something else. Something much more startling, in which ordinary scenes become electrifying experiences as Mann takes an old story and makes it feel new and unexpected. Framed in thrilling deep focus, Depp moves through familiar spaces – banks, restaurants, prisons, press conferences, wood cabins, cars, cinemas – that suddenly feel packed with fresh tension and atmosphere. Despite moving like a getaway wagon, the plot is the least interesting thing about Mann’s latest crime epic. This tale is really about the telling. Beyond the wild chases, daring jailbreaks and bank robberies, much of the movie unfolds in a weird twilight zone between docu-style reality and gorgeous mythmaking. Long before the breathlessly poignant final moments outside the Biograph, an eerie sequence sees Dillinger walking alone through a deserted police station. Better still is the surreal, funny scene in a packed cinema, where Dillinger sits sweating under the hot lights as a giant image of his face appears on screen while a public service announcement asks the packed auditorium to stay vigilant (“He could be the man sat next to you!”). It might be the movie’s best scene – try finding a better snapshot of the fame game’s seductive danger and dazzle. Public Enemies gets its coffee-shop moment, too, FBI hotshot Melvin Purvis (Christian Bale) and Dillinger staring at each other through prison bars in an exchange of sharp lines and even more piercing silences. 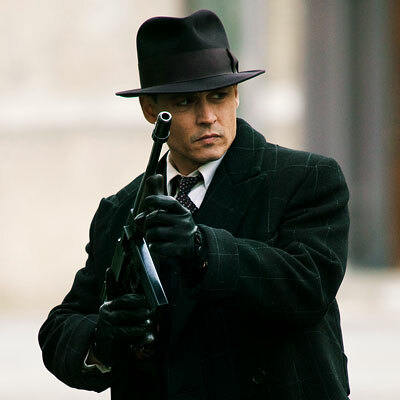 Initially looking too physically small to play a violent bank robber, Depp fills out the role of Dillinger with effortless charisma, authority and – most important of all – star wattage. But this is not Heat: we never sink into the life of Purvis or his rivalry with the gangster. Exploiting Bale’s trademark blankety-blank intensity, Mann keeps him a cipher. Same goes for Billy Crudup’s unctuous J Edgar Hoover and Stephen Graham as the sociopathic Baby Face Nelson. Like Crockett and Tubbs in Miami Vice , these characters actually have almost no real personality at all. But as we watch them attack their work with brutal efficiency, we have to take them deadly seriously. Not least because guns in a Michael Mann movie really sound like guns. Each deafening blam from characters’ pistols, rifles and submachine guns reverberates through your body as if you’d taken the bullet yourself. Public Enemies’ fire-fights erupt with sudden, visceral force – never more so than in a woodland shootout between Purvis’ FBI hit squad and Dillinger’s crew, lensed by Mann at the infamous Little Bohemia Lodge where it actually took place. Hot lead thwacks into tree bark. Desperate breath and muzzle smoke fill the night air. Bodies are wrecked by the carnage. But as ever in Mann’s world, the real heat around the corner is the romance that’s just out of reach. From Manhunter to The Last Of The Mohicans to Heat to Miami Vice , Mann’s career is a secret string of beautiful, impossible love stories. Here it’s La Vie En Rose Oscar-winner Marion Cotillard as Dillinger’s girlfriend Billie Frechette. Call it the anti-American Gangster. And we mean that as a compliment. This superstar crime thriller emerges as something surprising, fascinating and technically dazzling. Don’t expect a Hollywood movie. Expect a Michael Mann movie.